The net artists Gretta Louw and Helen Varley Jamieson warmly invite you to PLATFORM (Munich) for an evening of networked performance: an exhibition tour and the launch of CyPosium – the book, with online performative readings. Join the event online from 7.45 PM : this link will be live 15 min­utes before show­time. The read­ers are: Alberto Vazquez (Argentina), Annie Abra­hams (France), Christina Papa­gian­nouli (UK), Clara Gomes (Por­tu­gal), Helen Var­ley Jamieson (Ger­many), James Cun­ning­ham (Aus­tralia), Liz Bryce (Aotearoa New Zealand), Mil­jana Perić (Ser­bia), Nathalie Fougeras (Swe­den) and Vicki Smith (Aotearoa New Zealand). 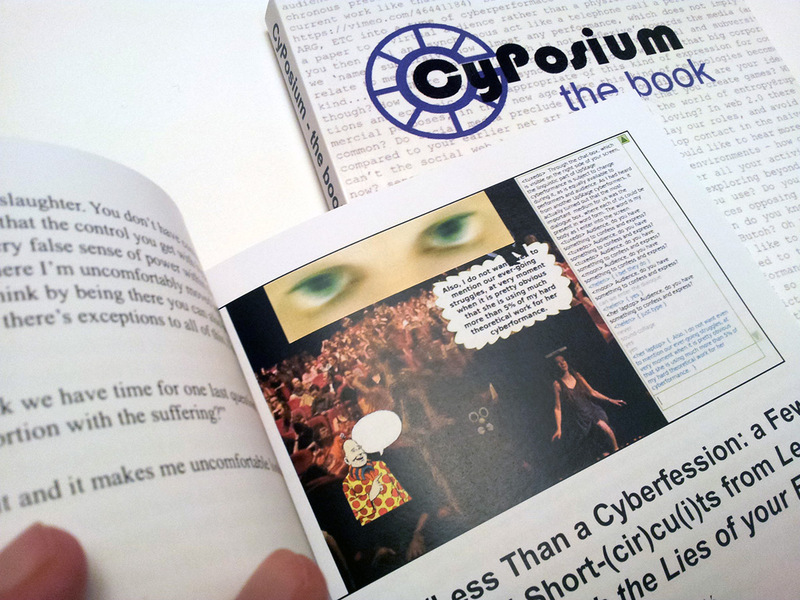 Edited by Annie Abrahams and Helen Varley Jamieson, CyPosium- the book presents selected material from the CyPosium, a one-day symposium held in 2012 to discuss cyberformance. The book is published by Link Editions in partnership with La Panacée (Montpellier). It is avail­able as a free pdf or full colour hard copy. The contributors of the book are Adriene Jenik, Alan Sondheim, Alberto Vazquez, Annie Abrahams, Auriea Harvey and Michaël Samyn, Cherry Truluck, Clara Gomes, Helen Varley Jamieson, James Cunningham, Joseph DeLappe, Liz Bryce, Maria Chatzichristodoulou, Maja Delak and Luka Prinčič, Miljana Perić, Rob Myers, Roger Mills, Ruth Catlow, Stephen A. Schrum and Suzon Fuks. Some of these contributors, and organisers of the CyPosium, will appear live on Friday evening from their locations around the world, to read extracts from the book. The book launch is organised in the frame of the exhibition Net Work, curated by Gretta Louw. This exhibition deals with work that is located at the intersection of performance and net art. The emerging genre of networked performance makes strong statements about the development of art history, and also about our relationship to technology and its impact on culture, society, labor and psychology.